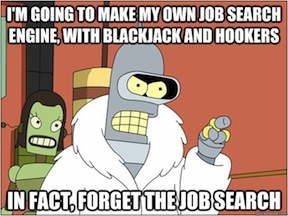 In the last post I showed you how to automate your job search. Unfortunately, the best search engines for sound engineer jobs do not allow this; either they are behind paid gateways or they don’t play well with RSS. Let’s take a closer look at those sites now. I’ve been on the job hunt for over ten years – one of the perks of being an independent contractor who moves a lot. I’ve only ever landed two jobs from search engines, but they were a great national tour and a super fun play. So even though search engines only got me two gigs, but I still use them, for three reasons: 1) the chance that something will come up that I really want; 2) to make contacts; and 3) to share jobs with people like you! (Speaking of which, you should probably follow me on twitter.) I might not get hired for a particular job, but each post can be a great opening to meet the people producers and managers who will no doubt be hiring again in the future. Pros: All of the listings are real jobs in theatre; no internships or bar gigs. It seems to be well curated. Right now I see eight audio-related jobs listed across the U: six full-time, one part-time, and one seasonal. This site is how I landed a national theatrical tour. Cons: Most listings are for the eastern half of the US & Canada, so the rest of us should be prepared to travel. Pros: This site is run by a lighting designer, Patrick Hudson, so it’s just for people like us. Mostly theatre, but there are some concert jobs as well. Cons: The site has one major problem: I can never stay logged in! Every time I submit a query, I get logged out. I have been back and forth with Hudson on this, and we can’t figure it out. Hopefully you won’t have the same problem. If you do, you can can still search the job listings, but you’ll have to log in again to see the contact info. There are other national job databases, but most are not very good for finding sound engineer jobs. Your next best bet is your local theatre arts community website. In the bay area you can pay $70 to become a member of Theatre Bay Area and search their listings for a year. This is how I got my first sound design gig in San Francisco with Boxcar Theatre. In Austin I used Austin Actors. Look under Cast and Crew Calls. Have more local sites to share? Comment below! You might also try Music Jobs ($10/month) for concert, PLASA and InfoComm for AV install, USITT for theatre, AACT for community theatre, Blue Room for backstage jobs in the UK, Playbill for theatre in NYC, and Cirque du Soleil. I’ve applied for jobs through several of these sites without much luck. Let me know how it goes for you. Artsearch and Off Stage Jobs are your best bets for concert and theatre jobs for sound engineers and sound designers. Local listings in your city are the next best option. Often there are crew calls in the local theatre arts community sites. There are lots of other industry and show specific sites that you should have on your radar, but they are hit and miss.